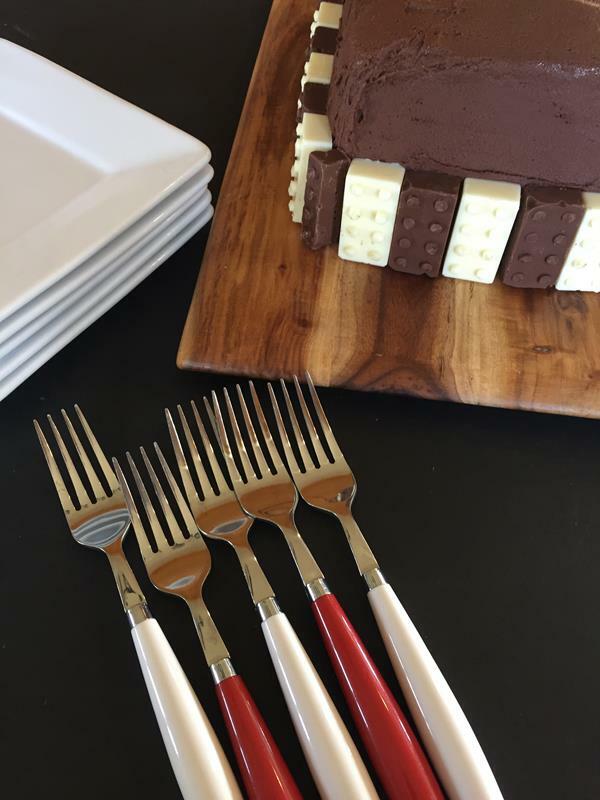 If your family or child loves Legos this easy Lego Cake is a must make for your next party. I think this cake might be one of the easiest, yet best birthday cakes that we have made. Last weekend my daughter made two Lego cakes for a party that turned out great. After she finished the project I knew I had to share what she did because it was so easy to make. You can use the same basic idea on just about any cake. This is more of the basic instructions for what she did than it is an actual recipe, but it is so easy that anyone can do this. For the cakes we just kept it simple and used our favorite gluten free chocolate cake which is my gluten free mayonnaise cake recipe. You can use any chocolate cake recipe or boxed cake mix that you like. 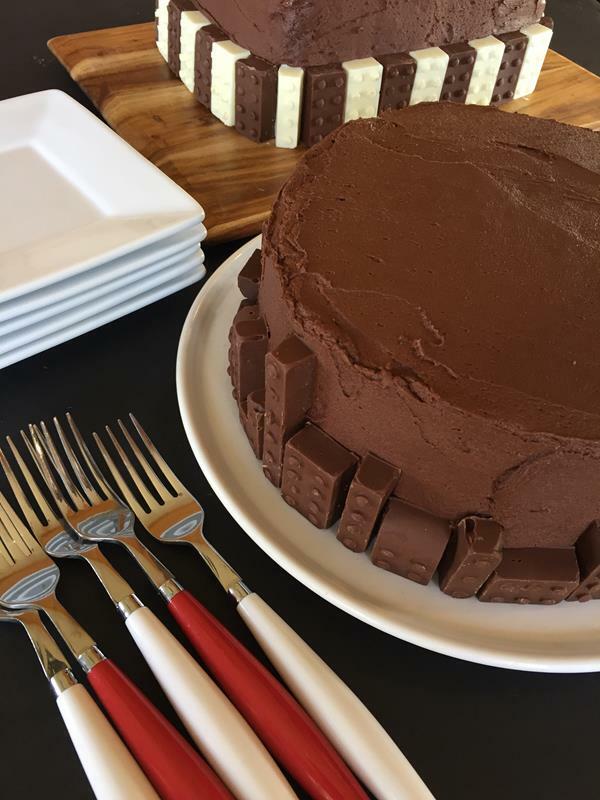 We used chocolate because we love chocolate. For the first cake my daughter made it in two round cake pans and used a basic chocolate frosting between the layers and for frosting the cake. For the second cake she made the same cake recipe, but baked it in a 9×13 pan. She cut the cake in half and turned it in to a four layer cake with raspberry filling and chocolate frosting. She used the raspberry filling from this cake recipe. It was delicious. The raspberry filling with chocolate frosting is one of my favorite cakes. Now for the lego part. We used these Lego candy molds that I bought from Amazon. They were inexpensive for the amount of molds that you get and I knew that we would use these many times. Legos are one of those things that are always popular, so I knew we would be using these many times over the years. 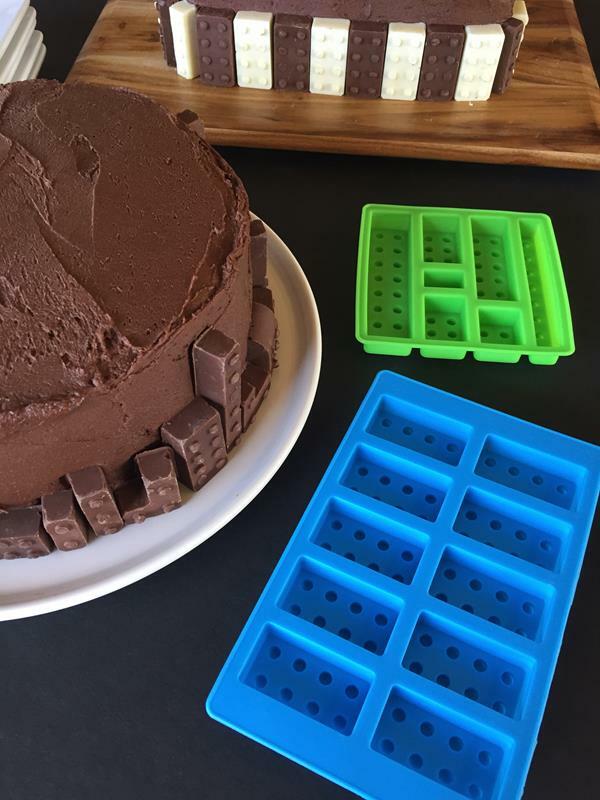 The molds can be used for fondant, chocolate, homemade soap, ice, and more. We are not big on fondant for cakes. We like the look, but not really the taste. Chocolate is more our thing. So we made chocolate Legos. And really chocolate Legos are just fun. We had some trial and error with making these. First of all the Legos are not perfect. The Lego perfectionist will find some flaws with the sizing etc., but in general the are perfect for this type of thing. They definitely look like Legos. One of the things we tried was to color the white chocolate to make colored Legos. What we ended up with was pastel colored Legos. The amount of food coloring it would take to get the main Lego colors would be huge and I am not sure you could even get it with that. Pastel Legos would be great for a girl that loved Legos, but since our cakes were for boys, we decided to just keep it simple with chocolate and white chocolate. We used milk chocolate for the chocolate Legos and white melting chocolate for the white ones. I will say that this takes quite a bit of chocolate. Way more than I thought it would, but you really don’t need that many Legos to go around a cake like we did. My daughter frosted the cake. 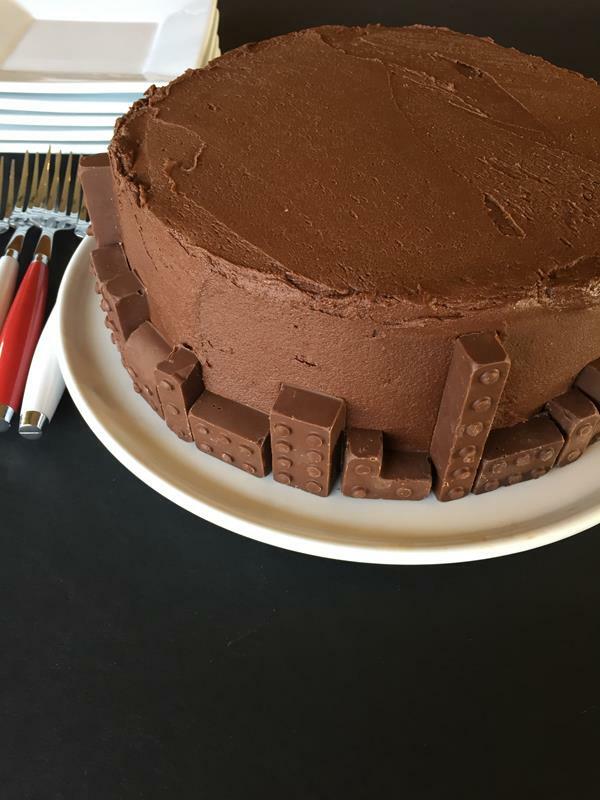 She laid out the basic Lego design that she wanted to make and pressed it in to the sides of the cake. 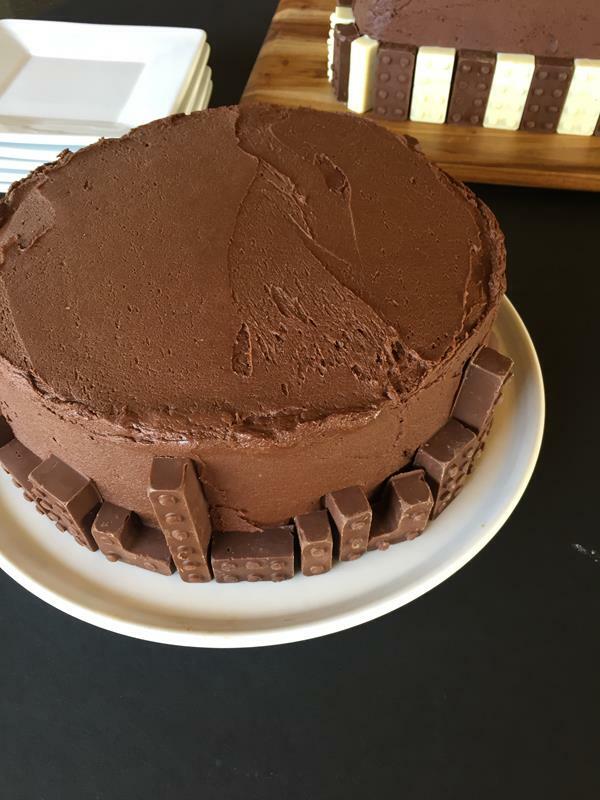 One cake looked like a cityscape and the other one was just a basic brick design. She refrigerated them until we were ready to serve them so that the chocolate would not soften. They are not perfect cakes, but they were fun and easy to make. Perfect for any Lego lover.